I was going to start blogging through another game tonight but those plans haven’t worked out all that well. My most recently acquired bit of hardware is a Commodore 128 – I’ve wanted a C64 for a long time but the 128 had to be the better bet for Ultima 5 alone. I was looking forward to giving that another playthrough but when I got it set up my C128 turns out to have a faulty RAM chip. No great harm done as a replacement chip is only 99p but soldering it in will be a pain and I have to wait for it to arrive in the meanwhile. Having failed on that front, plan B was to start on Wing Commander 3 on the 3DO which should have been easy except I discover that every set of AAA rechargeable batteries in the house has gone flat simultaneously and I can’t swap my TV onto the AV channel without the remote. Plan C was Ultima 5 on the NES since that uses the RF connection and I don’t need a remote control for that. This did work but I quickly decided that for once emulation was going to be the better option due to the sluggish speed of the game on the NES. Despite the mostly negative things I’ve heard about it, I actually like the look of the NES port but there is no way I’d make it to the end if I can’t at least double the speed. The lesson with all this is that while the original hardware is usually better, there are definite advantages to emulators. 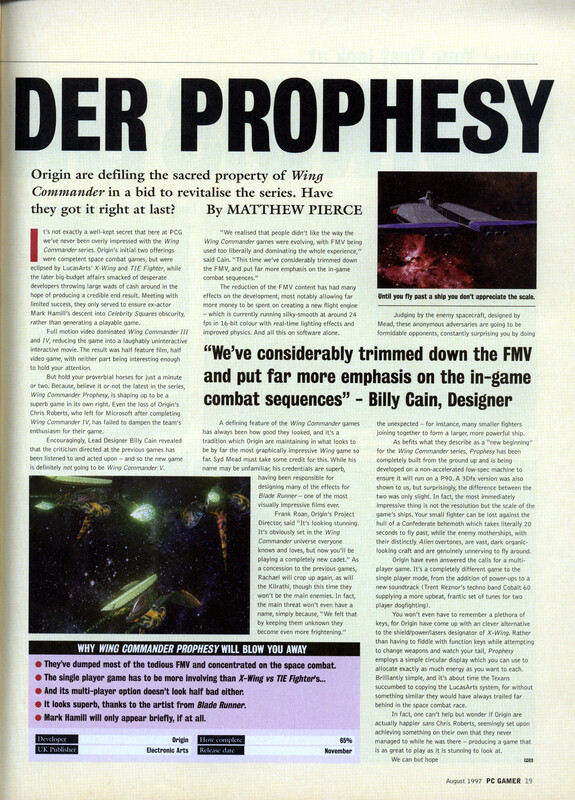 I thought I should at least post something as I may not get chance the rest of the week so it’s a scan from the August 1997 PC Gamer of a Wing Commander Prophecy preview. 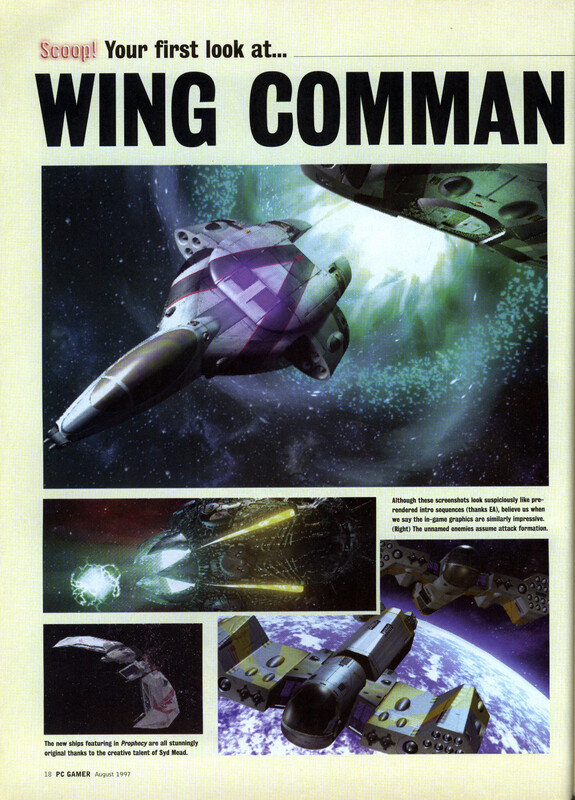 If you’ve seen any of the other PC Gamer scans you will know roughly what to expect from their Wing Commander articles by now. As ever they take the chance to have a go at WC4 but are more optimistic about Prophecy even if they didn’t manage to spell it correctly. Interesting to see that Billy Cain agreed with them to an extent saying that FMV was used too liberally in WC4 dominating the experience. Speaking for myself the copious use of FMV is one of the reasons why I love WC4 so much and I was disappointed at the time that it wasn’t kept going in Prophecy. There was a strong backlash against interactive movies by this time though so I’m sure I was in the minority with that opinion.